Social media is importance whether you’re an online retailer or a bricks-and-mortar retailer. Your web presence can make a big difference in your gross sales either way. But having a store on the web presents a unique challenge. If you put up an e-commerce site without doing the proper work, no one will show up. Websites have to get some traction through online interactions and quality content before they bring in some coin, and social media is the fastest way to begin your monetization on the web. Just as you can learn from the mistakes of others, you can learn from their successes. The online business featured here is one of the top e-tailers in their category. In 1999, businessman Gordon Becker was selling coins on eBay as a hobby. He also had a love of fine watches and had collected far too many. His wife, Carolyn, suggested that he sell some watches on eBay, thinking that the customer demographics for rare coins and fine timepieces were similar. 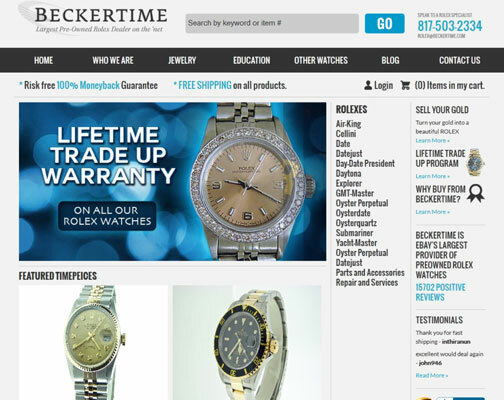 By 2003, sales got so big on eBay that they started the Beckertime online store. Combined eBay and website sales in 2005 soared to $4.5 million. Today, their website is the hub for Internet sales, as shown in the figure. As one of only ten diamond-level Powersellers (eBay’s highest-level seller designation), they are the largest provider of pre-owned Rolex watches on eBay, with a monthly sales volume of more than $1,000,000. They have an 11-year positive feedback rating of 99.9%. YouTube: Beckertime, to date, has 10 instructional videos on how to wind, set, and take care of various Rolex watches. Blog: The blog is the hub for articles that feed out to the web. Every few days, a new post appears on various Rolex models, how to spot authenticity, how a Rolex works, and more. Facebook: People love to connect on Facebook, and Beckertime’s page is full of interesting posts. People post Rolex questions and the owner answers swiftly and sincerely. As you can see in this figure, their Facebook page has links to their other social media platforms. Google+: The Google+ presence links to posts from their blogs. Although interaction isn’t as brisk at this time, being on Google+ is a worthwhile investment in the future. Pinterest: Beckertime has an almost encyclopedic volume of photos of the many variations and styles of Rolex watches. They see lots of participation on Pinterest, with likes and repins. Newsletter: Don’t consider e-mail old school. Beckertime still gets sign-ups for their e-mail newsletter. 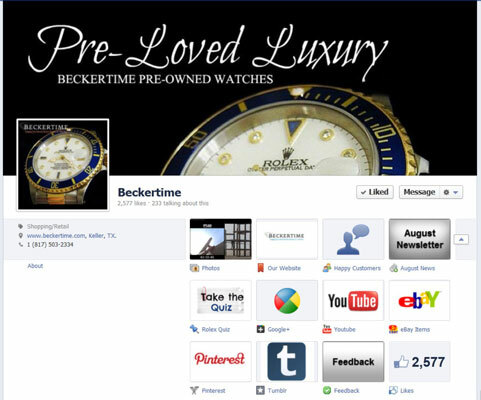 Beckertime continues to increase their business, looking to join any new media platform that will help get the word out.